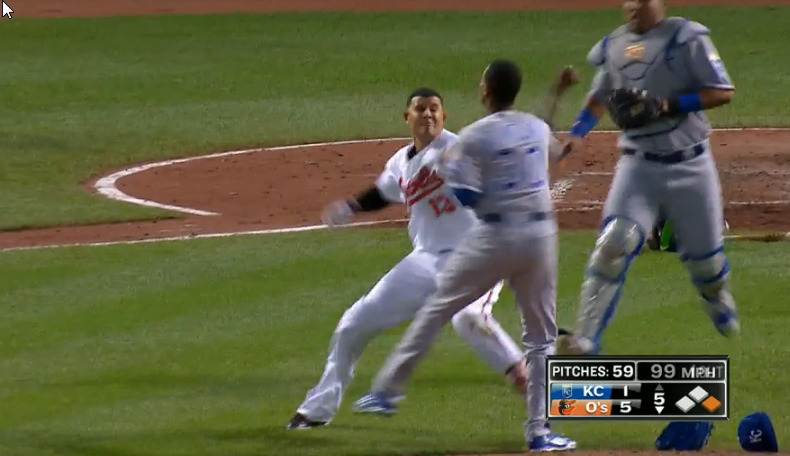 A brawl broke out between the Baltimore Orioles and the Kansas City Royals after Yordano Ventura hit Manny Machado with a pitch. The incident came in the fifth inning when Ventura hit Machado with the first pitch of the at bat. The pitch hit Machado in the hip. After taking a couple of steps, Machado dropped his helmet, ran towards the mound, and punches were exchanged. This came after an earlier at bat in which Ventura just missed hitting Machado with a pair of pitches. Later in that at bat, Machado just missed hitting a home run and as he walked towards first base, he could be seen yelling at Ventura.